WHEYPACK project aims to demonstrate environmental and socio-economic benefits of a biodegradable food packaging material with a lower environmental impact through the reduction of greenhouse gas (GHG) emissions in comparison with current petrol-based food packaging materials. The biodegradable food packaging material selected is Polyhydroxybutyrate (PHB) that will be obtained from a by-product (whey) that comes from the cheese industries; PHB will be produced using a process of microbial fermentation. The amount of whey produced in Europe is really important and it is a surplus of this industry. The PHB material will be used for the production of economic and competitive packages for dairy products uses. Hence, the industry that generates whey, among others, will become the beneficiary of the new packages tailored to the needs of their products, so valorising the whey surplus and closing the life cycle, taking into consideration the lyfe-cycle thinking perspective. WHEYPACK project wants to demonstrate that carbon footprint of manufacturing process of PHB-based food packaging is lower than current manufacturing processes of PP-based ones. To achieve this, WHEYPACK project has been divided into two main processes: fermentation process for obtaining PHB material from whey and biopolymeric injection process for obtaining food packaging. Regarding to the fermentation process, the target of WHEYPACK project is to demonstrate that the production of PHB from whey has a lower carbon footprint than the current process for plastic production from fossil sources. Additionally WHEYPACK project will demonstrate that this process is both economical and ecological efficient and it can be used as an alternative for whey disposal in all European dairy food industry. Regarding to the injection process, the scope of WHEYPACK project is to demonstrate that the current manufacturing processes of polymeric food packaging can be used for obtaining biopolymeric packaging without increasing the carbon footprint of the whole process. On summary, first of all WHEYPACK project will generate PHB from whey by means of a fermentative process. Secondly, this PHB material will be modified with different additives in order to obtain a final PHB-based material which can be processed with the same technology as polypropylene-based material. Then, PHB-based trays will be produced by injection moulding technology. Finally, the food application of PHB generated trays will be tested with cheese products. 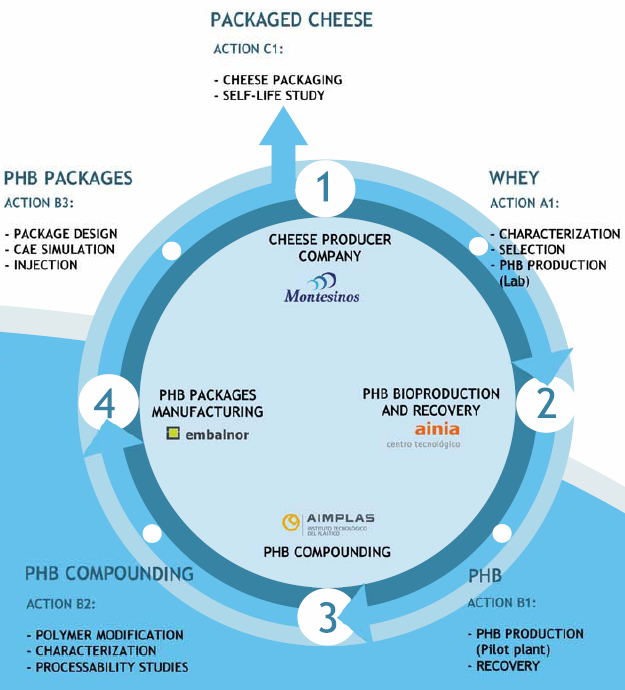 Thus, WHEYPACK project can be considered as a close loop project, due to the whey generator (cheese industry) will become the beneficiary of the new PHB-based packaging, tailored to the need of its products. The project is being performed trough a cross border collaborative project (Spain and Portugal) with a multidisciplinary human work team with high experience in food technologies and production, bioprocess technologies, microbiology, physical-chemical analysis, polymer technology and food packaging manufacturing.